Dental School, by the nature of the material taught, maybe overwhelming for a newcomer. Overnight, a student who previously excelled in theory and didactic classes is confronted with the challenges of performing manual skills, which he has never encountered previously, on a minute scale. Acquiring new manual skills and dexterity, which lay the ground work for a solid foundation, depends on the teaching methods. Skills acquisition, along with conceptualization and mastery, relate directly to the teaching tools used to transfer knowledge and information from teacher to student. This is especially true in dentistry where the concepts of tooth preparation involve visualization in three dimensions. First year students are challenged with acquiring fine manual skills and understanding a 3D vision of the tooth. Augmented Reality Technology allows the teacher to break down cavity preparation into individual steps. The student works on each skill until he masters it and goes onto the next, preparing him for actual clinical work. Feedback, self-assessment and forward thinking are key factors of this method of teaching, including: Depth, Wall Angles, Outline Shape, Centralization, Retention, Long-Axis, Hand piece Positioning, Ergonomics and Self-Assessment. 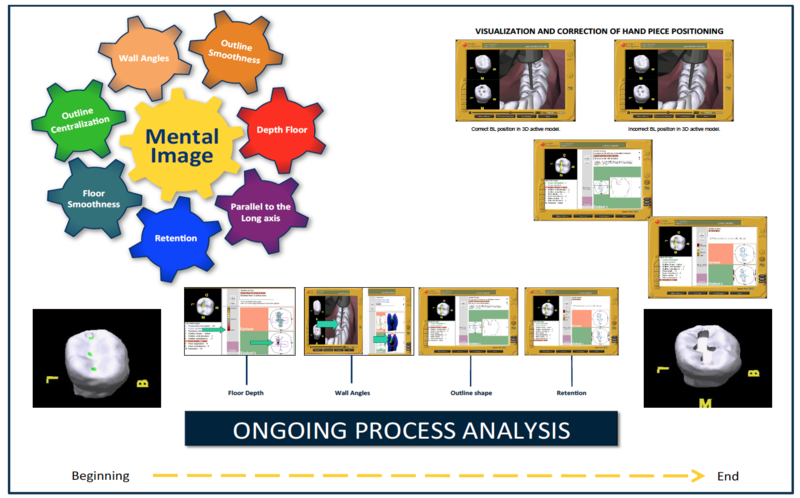 Our analysis comes from reviewing struggling points from a group of dental students and providing solutions by using Augmented Reality Simulation. These difficulties could have been avoided by using Augmented Reality Technology from day one of Dental School. A student cannot get ongoing feedback from the instructor during his drilling session; especially during the sensitive initiation period of manual skills acquisition. Enabling students to receive ongoing feedback on their preparation at any moment of the procedure, any time they need it, optimizes learning potential. The teaching message is delivered as a package of information (wall angle of 90 degrees, floor depth of 2.3mm, outline shape, etc.) that may confuse the student about where to start and which direction to take. Focusing on developing and mastering skills individually guides the students thorough the entire process. The student relies on instructor feedback and availability and may not readily develop skills of self-assessment and critical thinking, which are the backbone of the clinical judgment. Enabling the student to practice skills acquisition with self-assessment prepares the student for clinical challenges by developing critical thinking skills. Cavity preparation principles involve an understanding and a visualization of the 3 geometric planes (MD, BL, and OG). These may be difficult for the student to conceptualize using 2D materials. Real-time 3D visualization during the preparation process allows the student to develop a mental image of the intended outcome. Students in traditional lab settings often evaluate their work with instructors after completing their work instead of during the process. Clinically unacceptable errors maybe encountered more frequently after they are made, rather than their being prevented beforehand. Assessment of ongoing process and not outcome is enabled by real-time feedback.